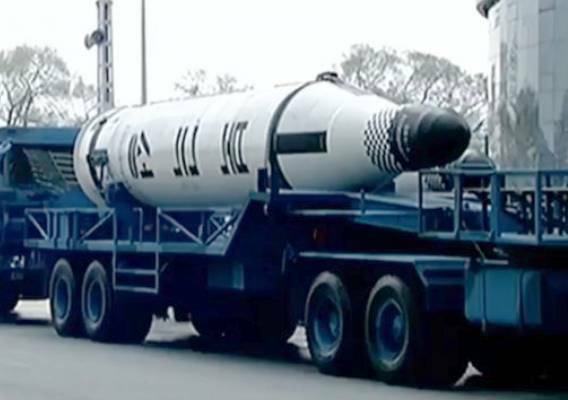 North Korea's "Pukguksong-1" is a small two stage solid-fuel SLBM ! 2017, April 15 -- New pictures of Pukguksong-1, seen on the parade. Nozzle bay + Skirt with not changed grid fins ! Wall reinforcing winding ? 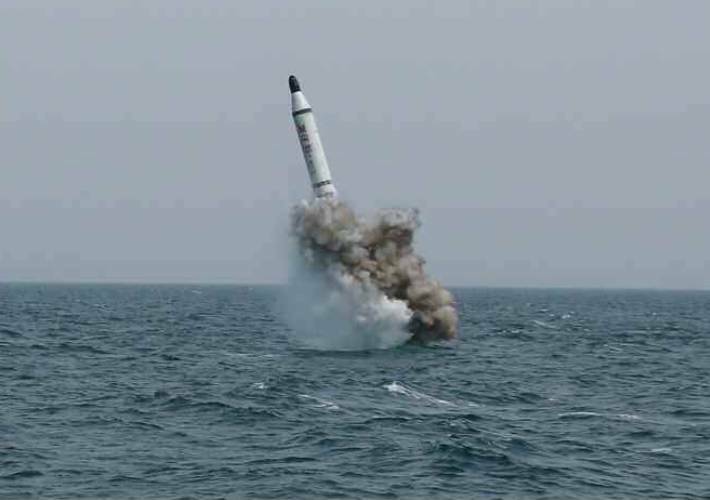 2016, August 23 -- A successful launch from a submarine with ballistic trajectory and a range of 500 km. 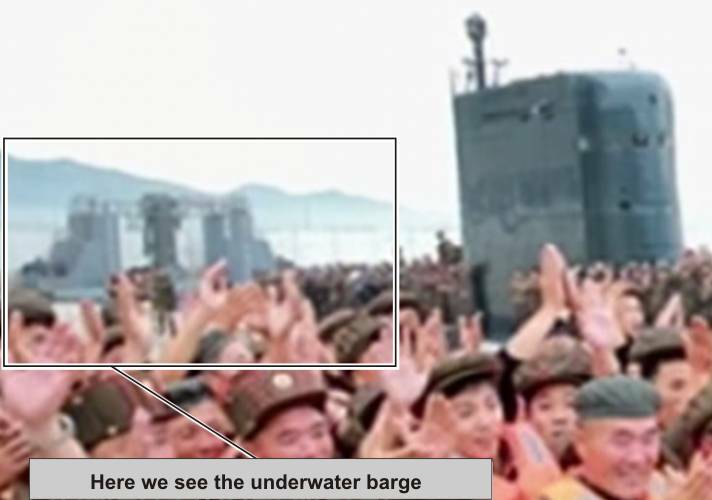 First photos were shown on loading the rocket in a submarine. 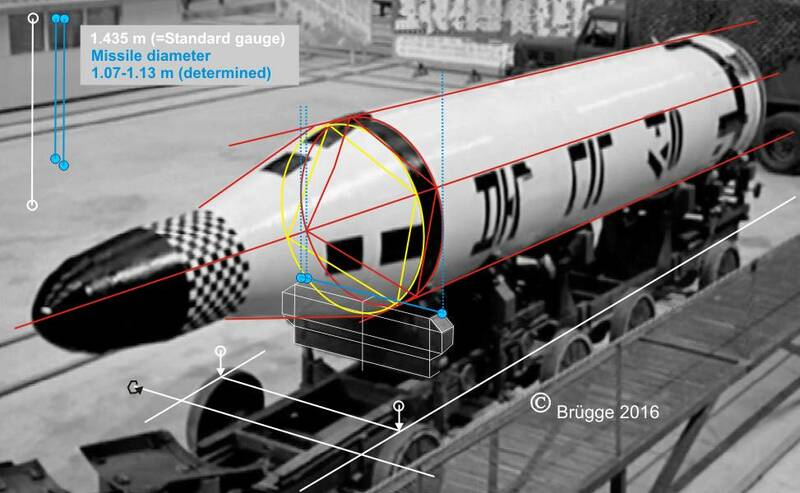 The missile has now grid fins. 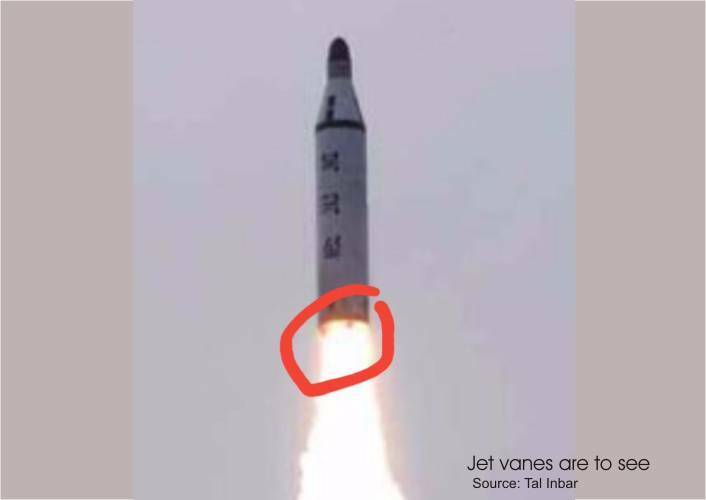 Now is also clear, that the missile is a two-stage vehicle. It is a two-stage missile ! 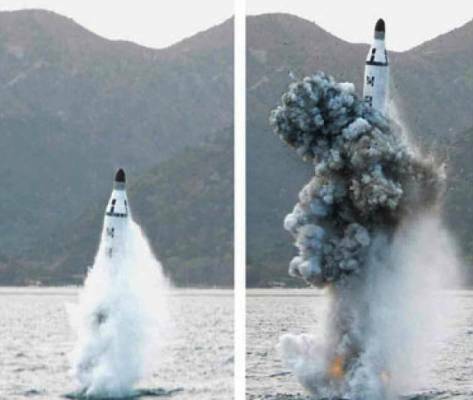 2016, July 09 -- North Korea has test-fired a further Pukguksong missile from a submarine but it failed in its initial flight, South Korea's military says. 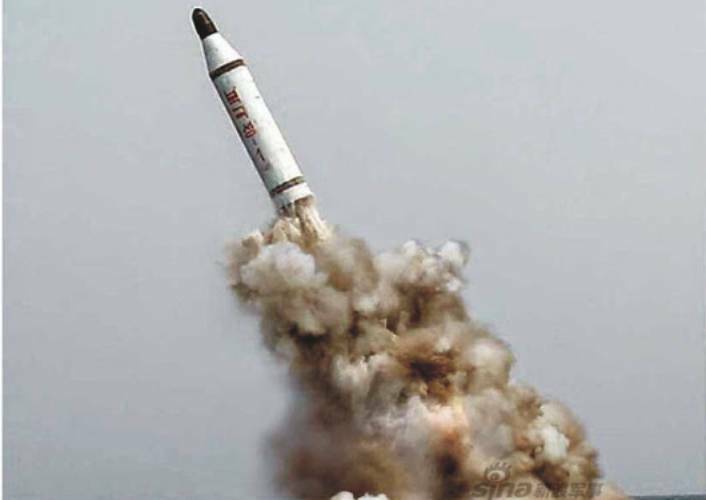 2016, April 24 -- North Korea said a submarine-launched solid-fuel ballistic missile test it conducted had been a "great success". 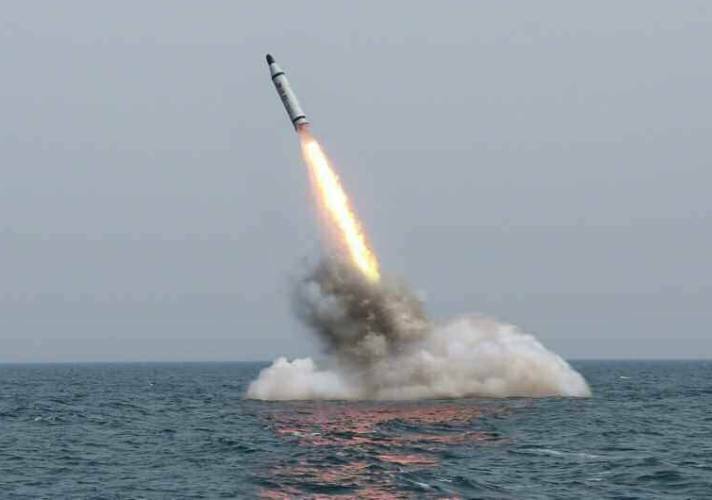 North Korea fired the missile from a submarine off its east coast on April 23 and it flew for about 30 km, a South Korean Defence Ministry official said. 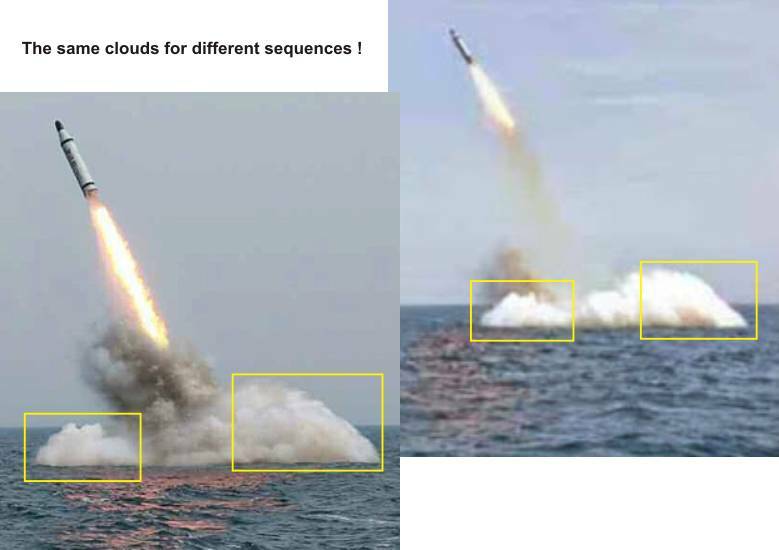 The North Korean State TV also showed what it claimed were underwater images of the missile being ejected from the underwater tube. 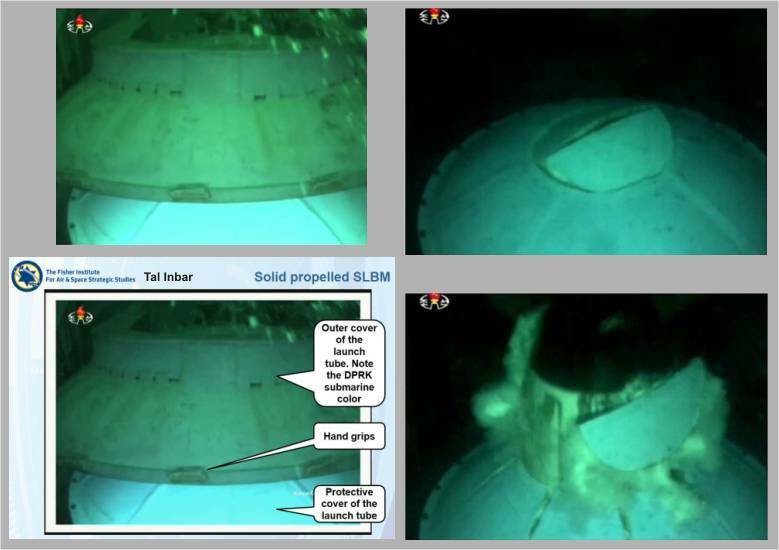 The KCNA report argued that the missile was launched from its maximum underwater depth, and that its "cold-start" ejection mechanism and high performance engine using solid fuel worked without a hitch, along with its flight controls and warhead release systems. It is now clear that the Pukguksong with the R-27 technology never had to do. 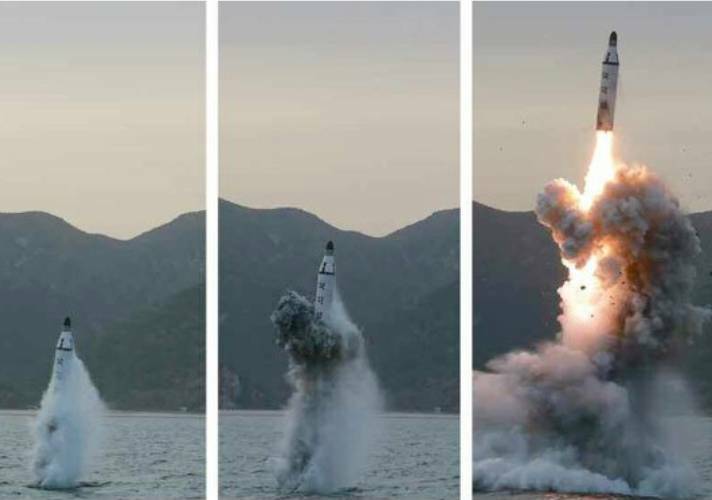 I believe, the importance of the solid-fuel Pukguksong-1 naval missile is overestimated. 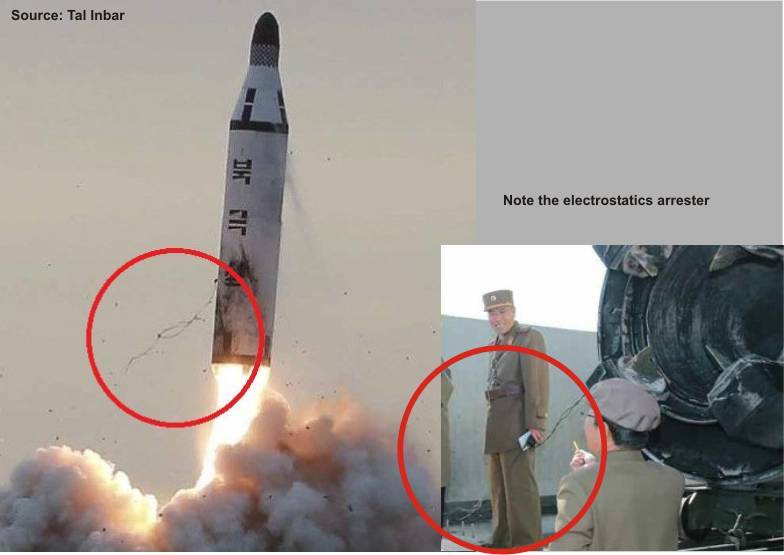 It is only a small rocket for tactical purposes and a down-scaled Pukguksong-2. 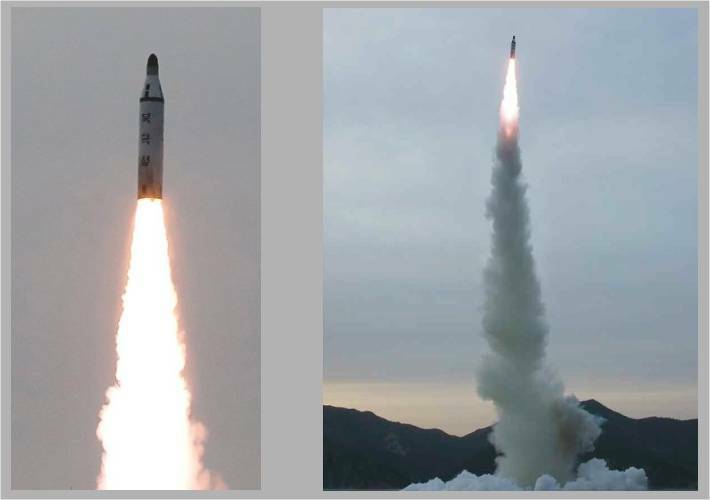 2015, November 28 -- North Korea tested its SLBM from submarine after announcing the successful launch of such a missile in April. 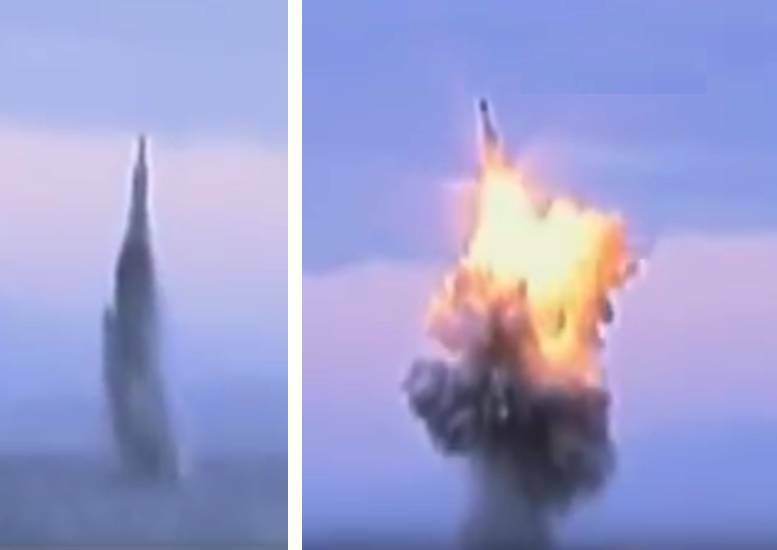 The SLBM, however, failed to soar from the waters. 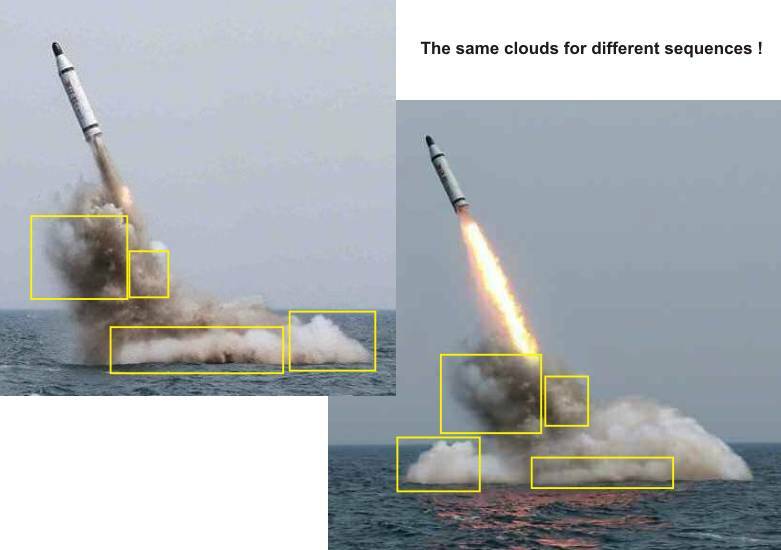 "A closer look at photograph reveals Photoshop work at the back end of the missile. Rectangular graphic blocks appear to have been inserted. The detached flame could be a result of this editing. Thus, any conclusions about the propellants derived from the exhaust flame are ambiguous." 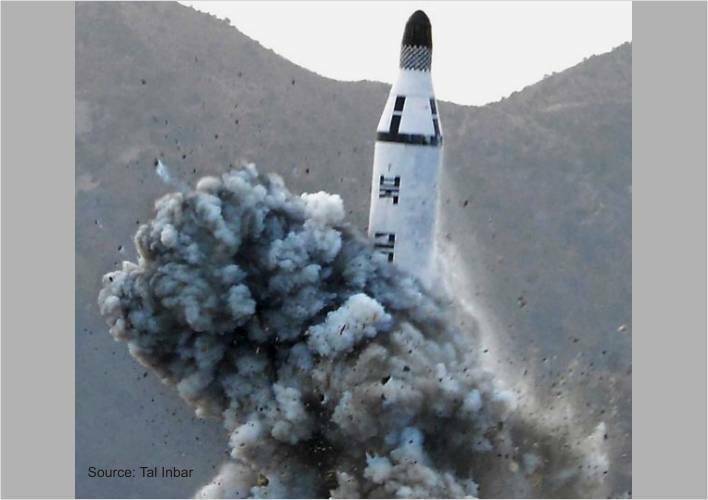 2016, March 24 -- Korea Central News Agency (KCNA) reported that North Korea had successfully conducted a high-powered, solid-fuel rocket engine test. 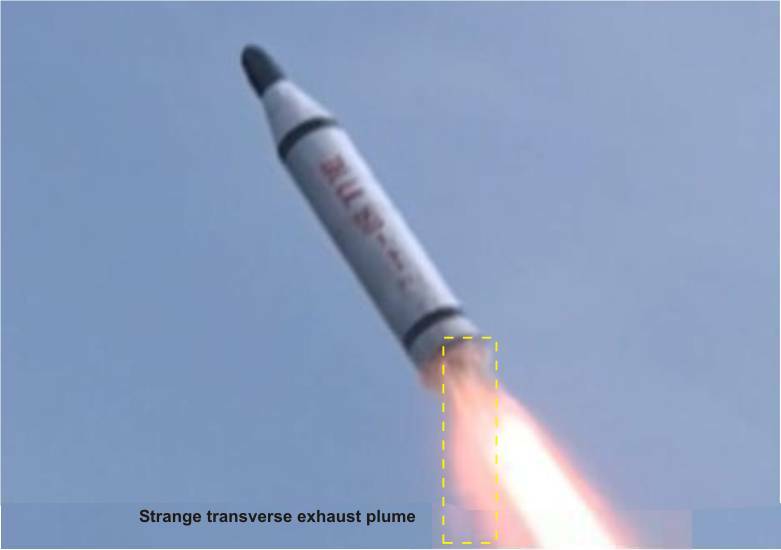 “The test was aimed to examine the structural safety of the rocket engine newly designed and manufactured by the Korean style and its thrust and estimate the working specifications of heat separation system and other system,” the English version of the KCNA article reads.